Some places Indian dinner may not be provided but alternative Vegetarian Dinner. Local Departure airport tax- Siem Reap airport tax only 25 USD/pax- this is compulsory for the passengers to pay themselves, the agent are not allowed to pay on behalf of passengers. Today you catch a local flight to Siem Reap. (Approx departure at 08:00hrs and arrival 09:00hrs) You visit the Angkor Thom (the Great City) including the Southern Gate, Bayon temple, Baphuon temple, Terrace of Elephants, Terrace of the Leper King & Phimean Akas : “Celestial Palace”, dedicated to Hinduism. Today you continue with a full day tour for Angkor complex. Visit the Gate of the Death, Thommanon, Chaosay Tevoda, Banteay kdei, Kravan, Srash Srong, & especially Ta Prohm Temple. Later visit Pre Rup, Mebon, Tasom, Neak Pean, which means ‘coiled serpents’, from the encoiled nagas that encircled the temple and Preah Khan. This morning you take a visit to Banteay Samre temple that contains legend scenes of Vishnu and Krishna. 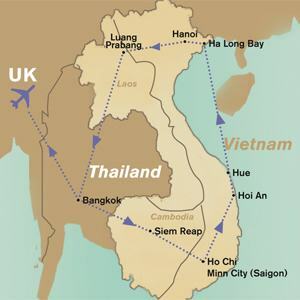 Then fly to Saigon or Ho Chi Minh City. .(Approx departure at 13:30hrs and arrival 14:50hrs) On the way to hotel, stop over at Neo-Roman Notre Dame Cathedral, Municipal Post, Ho Chi Minh City People Committee, Municipal Theatre, Reunification Palace, the old US Embassy the Prime Ministerial building and many more. Drive to My Tho-Gateway of Mekong Rivers. Cruising along Mekong River and its canals to visit farmer’s houses and taste delicious fresh fruits. This morning you fly to Da Nang,(Approx departure at 11:30hrs and arrival 12:40hrs) an ancient land closely connected with cultural traditions. You visit Museum of Cham Sculpture and stone carving villages at Marble Mountains. Then, continuing travel to Hoi An ancient town. You enjoy an interesting town-tour by tricycle. Firstly, visit The Japanese Covered Bridge, Ong Pagoda, Hoi An's old quarter. Continue to Quan Thanh De Quan (Quan Van Truong). Fukinese Assembly Hall, Tan Ky Ancient House, and Hand-made Silk workshop. Then, take a trip to Hue, to have a look at Lang Co beach to view over beautiful landscapes. Enjoy a half day tour of Hanoi. You visit the Chairman Palace area, Ba Dinh National square, Stilt House; One Pillar Pagoda, continuing to the Temple of Literature known as Vietnam's first university built on 11th century and Viet Nam Fine Arts Museum. Afternoon, proceed the journey to Ha Long Bay. Drive to Marina for a sailing boat cruise on the Bay. You visit the imposing caves, grottoes, shapely islets and calm beaches. After cruising, drive to Hanoi- Old Quarter and its shopping streets. Evening, you will watch the water puppet show, a unique art form and truly traditional show. This morning fly to Luang Prabang, (Approx departure at 08:45hrs and arrival 09:40hrs)the ancient capital of the Lao Kingdom. Check in the hotel and relax. Later you can explore Street Night Bazaar, where you can find the lovely collection and handmade textile by local and hill tribe. Today visit the ancient royal temples of Wat XiengThong, Wat Mai, Wat Visaounarath and the Phousi temple with 382 steps up for a good view of Luang Prabang panorama during sunset. Take the morning boat trip on the sources of Mekong Rivers. Visit the village of rice wine, Tham Tinh, Tham Phum, Pak Ou caves. Return to Luang Prabang and visit Kuang Si Water Fall. Free at leisure until check-out, transfer to the Airport for your return flight home.